Earth Science Books for Kids: Learn About Our Amazing Planet! 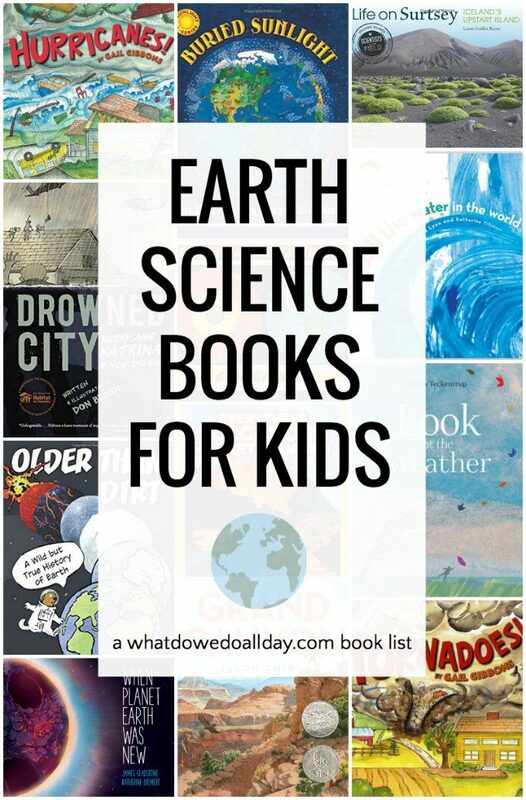 Making this list of nonfiction earth science books for kids really shone a light on how picky I am when I choose nonfiction books. It’s easy enough to put in a topic, such as “volcanoes” to the library catalog and find loads of books, but which ones will you actually enjoy reading with your kids? Now many of those nonfiction earth science books you will find on the shelves are perfectly good, well-written and very useful for kids looking for facts about why hurricanes form, or how many layers the earth has, and I don’t want to knock them. But to be perfectly frank, I don’t really want to read them! So, with all my pickiness, I hope I’ve created a list of nonfiction earth science books that address some of the relevant fields, such as geology, meteorology, ecology and oceanography that your children AND you can enjoy together. Hurricanes by Gail Gibbons. I really like Gibbons’s collection of nonfiction books. She has a large body of work and her texts are informative and easy to read, perfect for younger elementary students. However, anyone looking for some basic information about hurricanes will do well to read this book, too. I often think about much of my science knowledge as an adult has come from sharing these types of nonfiction books with my children! I also recommend Tornadoes! Ages 4 and up. Drowned City: Hurricane Katrina and New Orleans by Don Brown. Formatted like a graphic novel, this moving book looks at the physical devastation of Hurricane Katrina, as well as the emotional toll on its citizens. Ages 12 and up. Look at the Weather by Britta Teckentrup. This is my kind of earth science book! This oversized, thick book manages to flow like a poetic picture book while still fitting in tons of facts about meteorology and weather events. I love the way the text asks readers to stop and contemplate their own experience with weather—wind, rain, ice, clouds and more. And the illustrations are peaceful and enticing. A real treat. Ages 6 and up. Grand Canyon by Jason Chin. All of Chin’s books are spectacular and this book which investigates the geology of the Grand Canyon is no exception. The story follows a child and an adult on a walk through the magnificence of the Grand Canyon, detailing how the layers were formed, the plants and wildlife that live in the basin. There is so much information here that you and your children will want to read it over and over and then will immediately start planning your next vacation! Be sure to look for Jason Chin’s other books on the nonfiction shelf! Ages 5 and up. Buried Sunlight: How Fossil Fuels Have Changed the Earth by Molly Bang and Penny Chisholm. This is an absolutely gorgeous books and the illustrations really jazz up the tale of how fossil fuels like coal, oil, and gas are created over millions of years. I loved the idea that they are really “buried sunlight.” Bang and Chisholm have other books in this series which you should read! Ages 5 and up. Planet Earth/Inside Out by Gail Gibbons. Here’s another book by Gibbons that is worth reading. This book does exactly what the title suggests: it shows the layers of the earth and how they work together to form an amazing planet. Ages 5 and up. When Planet Earth Was New by James Gladstone. This is a nice overview of earth’s evolution with appealing illustrations that will take kids on a somewhat poetic journey of our planet’s history! Ages 4 and up. Older Than Dirt: A Wild but True History of Earth by Don Brown and Michael Perfit. As with Brown’s book on Hurricane Katrina (see above), kids will love the graphic novel approach to geological history. A quirky groundhog and a worm impact facts as they explore the earth, its natural wonders and volatile history. Ages 5 and up. National Geographic Kids Everything Volcanoes and Earthquakes by Kathy Furgang. National Geographic is always an excellent source of information and kids will love learning about volcanoes and earthquakes in this comprehensive an very readable overview of the phenomena. Ages 5 and up. Geology Lab for Kids: 52 Projects to Explore Rocks, Gems, Geodes, Crystals, Fossils, and Other Wonders of the Earth’s Surface by Garret Romaine. 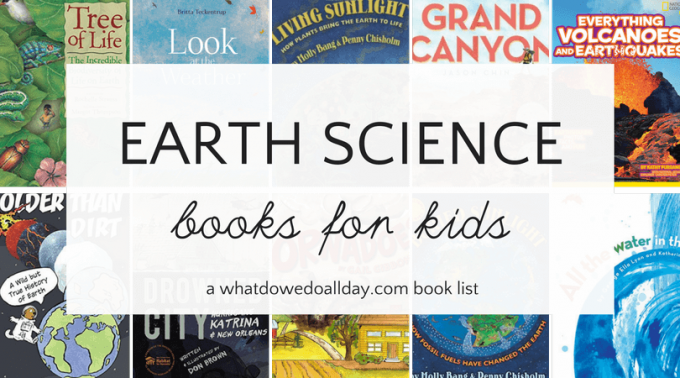 I’m throwing this activity book in this list of earth science books for kids, because I really love the LAB series of activity books. After reading all about the way earth is put together, kids will want to explore it for themselves! All the Water in the World by George Ella Lyon. A lovely poetic take on how water cycles around the world. I love the imagery in the illustrations and rhythm of the text. Ages 4 and up. Tree of Life: The Incredible Biodiversity of Life on Earth by Rochelle Strauss. A look at the five kingdoms on Earth, with beautiful illustrations. Lots of detail and new vocabulary will fill kids hungry for new information about Earth’s ecosystem. Life on Surtsey: Iceland’s Upstart Island by Loree Griffin Burns is a title from the great Scientists in the Field series of science-focused books. It is a fascinating look at how life develops on new land (1963!) and is particularly useful for older kids. Ages 8 and up. Ocean Sunlight: How Tiny Plants Feed the Seas and Living Sunlight: How Plants Bring The Earth To Life by Molly Bang and Polly Chisholm. Two great Earth science books that will dazzle kids with their illustrations while also imparting tons of information about how Earth’s ecosystems work. Ages 5 and up. « Sim Pencil Game: A Mathematical Brain Teaser for 2 Players! Another wonderful list! You might also enjoy “You are Stardust”, one of my 7 year old’s favorite books. I love that book! Great suggestion. I appreciate your pickiness and also your diligence in putting together truly wonderful lists! As you’ve mentioned, anyone can search “volcanoes” and come up with a “list” Unfortunately, that’s exactly what many bloggers do. Thank you for the time and effort that goes into ALL of your wonderful lists. I am recommending you to all of my friends. Thank you, Jessica! I work really hard to make sure my book lists are not “card catalog lists” and introduce people to quality books they may have overlooked! Happy reading!